The tennis bracelet scored its name in 1987 when professional tennis player, Chris Evert famously stopped her tennis match to search for her missing diamonds after the clasp on her diamond bracelet broke. The name tennis bracelet was a hit, so much so it lost its original name of diamond bracelet and from that moment forward was deemed tennis bracelet. The newly named tennis bracelet sparked the interest of women across the world due to characteristics of elegance and glamour, exuding from all tennis bracelet styles. 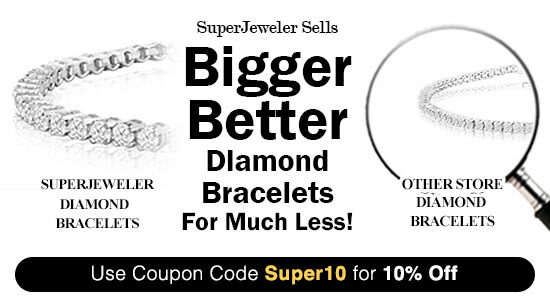 At SuperJeweler, we offer an enchanting array of diamond bracelet options, crafted and designed to suit any budget. Our tennis bracelet collection starts at $99 USD and goes up to $25,000 USD. Within these prices, we have many remarkable tennis bracelet options to choose from, which can be crafted in 14K white gold, yellow gold or the very trendy rose gold. Our diamond tennis bracelet styles range in total carat weight, starting with 1 carat tennis bracelet styles and ending with our largest option, a 15 carat diamond bracelet. At SuperJeweler, we offer tennis bracelets for all budgets and design all diamond carat weight options in between our 1 carat tennis bracelet and 15 carat tennis bracelet. All of our diamond tennis bracelet designs are exceptionally beautiful and unique to your personal style and budget. Our noteworthy tennis bracelet and diamond bracelet collection is the perfect gift for any occasion including Mother's Day gifts, first anniversary gifts, push presents, Christmas gifts or birthday gifts. Whichever occasion it may be, your loved one will adore our 5 Star rated tennis bracelet styles, all masterfully designed to last a lifetime.